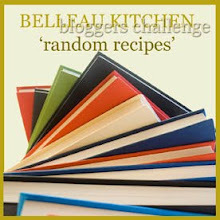 Random Recipe challenge for July is to choose a recipe at random from your Favourite cookbook. Eeek, how on earth do you choose your favourite cookbook? I have different favourites for different types of food and eating. In the end, as I am on a bit of a fat reduction mission, I decided to choose my favourite low-fat cookbook. And this is it! 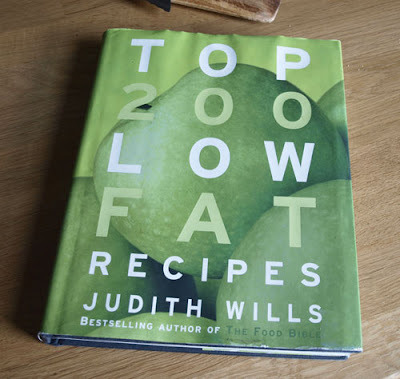 Top 200 Low Fat Recipes by Judith Wills, I've had it for years, it was published in 2003 and I've probably had it since just after that. There are many delicious recipes which are not 'diet' just lower fat versions, some of the recipes are old favourites, but as this is a random recipe challenge I opened the book at random and actually came upon a recipe I haven't made before. 1. Combine the sauce ingredients thoroughly in a jug or bowl and set aside. 2. 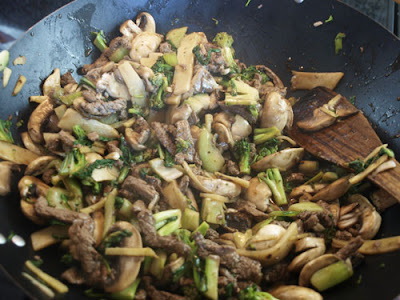 Heat the oil in a non-stick wok or large non-stick frying pan and stir-fry the broccoli over high heat for 2 minutes. 3 Add beef and stir-fry for 1 1/2 minutes, then add the ginger and garlic and stir to combine. 4. Add the mushrooms and bamboo shoots and stir-fry for 1 minute, then tip in the sauce ingredients, stir well and cook for a further 2 minutes, stirring continuously. Serve immediately with thread egg noodles or rice. Overall it was a nice combination, I had some pak choy so added that with the broccoli and doubled up the ingredients to make enough for four. I think it would have benefited from some chilli or a bit more black bean sauce as we had to add some extra soy at the table. But that my just be that I like a bit of a kick to my food. 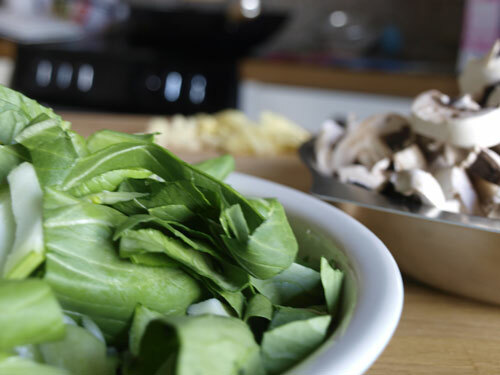 Remember to check out Random Recipes at Belleau Kitchen. This looks delicious but as you say, I'm sure a bit of extra chilli would just finish it off. Oooh, as I'm currently au pairing in Northern Italy and gorging on cheese and chocolate, this sounds wonderful. It'll be bookmarked for future reference durng the post-Italia diet!